Third in my series of Sandton Snapshot posts, leading up to the publication of SandtonPlaces. Read posts 1 and 2. I’m seriously behind in blogging and it’s starting to freak me out — so many stories to tell and not enough time to tell them. I have great stories and photos from Swaziland, the Free State, and even from my Port Elizabeth trip (which was more than three months ago), not to mention tons of Melville stuff. The list keeps getting longer and I’m continually bumping older stories in favor of breaking-news, like the publication of Johannesburg in Your Pocket or my rescue of the Hillbrow kitten. Anyway, blogging woes aside, I can’t let this week come to an end without a quick Sandton Snapshot. Today’s Sandton Snapshot is the Bean Republic. Bean Republic, on Corlett Drive in Melrose. It’s not in Sandton exactly, but in the general vicinity. Joburg has countless great coffee shops. Literally. There are too many great coffee shops to count and more are opening every day. The trendiest ones — Father Coffee, Bean There, Motherland, and Wolves, just to name a few — get tons of good press, all richly deserved. But there are many other fantastic coffee shops that miss out on the trendy coffee hype for one reason or another. Bean Republic is one of them. Bean Republic perhaps goes unnoticed due to its location, on a seedy section of Corlett Drive just down the road from the uber-hip Illovo Junction (where Wolves is) and around the corner from the upscale Melrose Arch centre. But Bean Republic’s location, although unlikely, isn’t hard to find. Bean Republic has an anti-establishment vibe, but not in the hipster-wearing-a-Che-Guevara-T-shirt kind of way that you might expect. Bean Republic is the real deal. 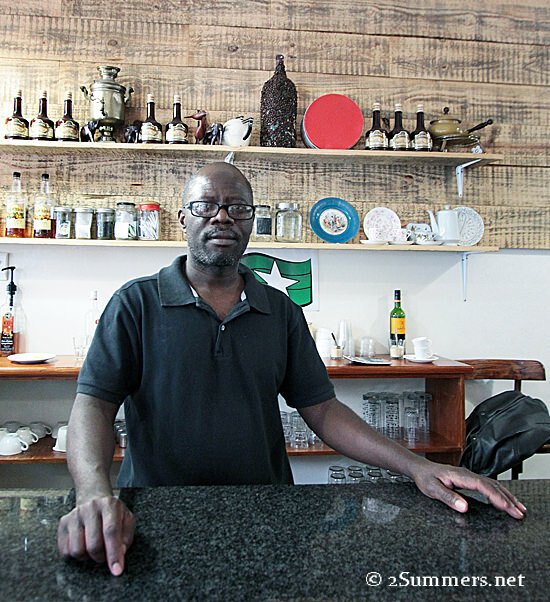 The shop’s owner, Edwin Nlovu, answers to the nickname “the General”. He wouldn’t say exactly why, but I get the feeling that the General has some stories to tell. Bean Republic has serious coffee, tasty food and smoothies, and hassle-free wifi. There is also a meeting room downstairs. The General. Incidentally, he used to work at Wolves. I visited Bean Republic intending to stop in for a quick cup of coffee, and wound up staying all afternoon. It’s just that kind of place. Check it out. 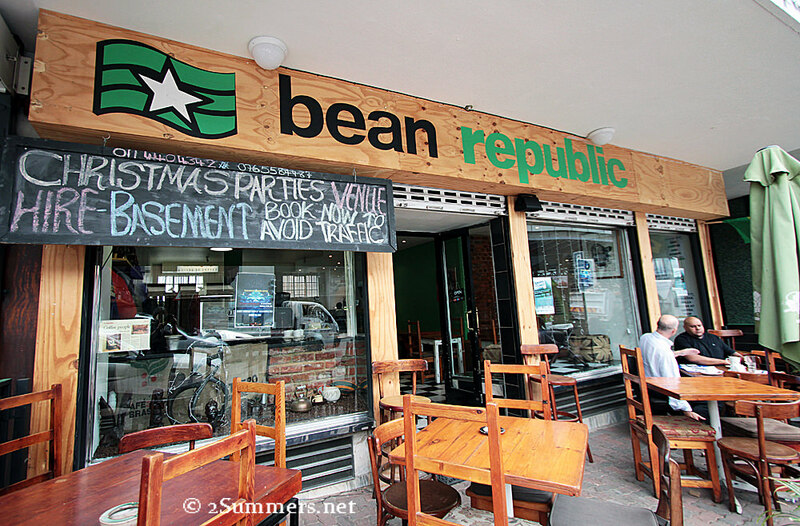 Bean Republic is at 81 Corlett Drive in Melrose, just off the M1 highway. Had to get up and make some espresso. You make me long for a coffee shop like this just down the road. Haha. Yep, it’s a great place. I wish it were closer to my house, actually. “so many stories to tell and not enough time to tell them.” I love that. Haha. Great review, Heather. Love the title of your post, as well. If I ever make it to SA, I will keep this in mind. Hope you have a wonderful weekend. They have live music at Bean Republic every Thursday night at around 8:30ish. Great coffee and great music! Thanks Johan. A friend of mine who lives in the area also told me that there are events in the evening sometimes. I’ll have to go check it out sometime.